I have been making return trips to hospital over the past couple of months for routine tests and examinations. These including a follow-up colonoscopy a year on from my surgery for bowel cancer and a CT scan plus tumour marker tests six months after I completed my course of chemotherapy. I am happy to inform you that Mistress C seems to have packed her bags and ended our affair for the moment. I feel now as if we barely brushed against each other, although I am also aware that from this point on she will never be that far away from me. Shortly after receiving this news I had the opportunity to travel up to Stevenage with the artist Aleksandra Mir to spend an afternoon at Airbus Defence and Space looking at their facilities and learning about their latest projects. This was part of some research Aleksandra and I are currently engaged upon – more of which will be revealed as events unfold. Security at ADS is pretty tight: we had to provide proof of identity, agree beforehand not to take cameras with us and to refrain from using any social media while on the premises. Having been issued with special passes, we were shown by our host around the assembly and integration areas, the workshops and clean rooms where satellites are manufactured and painstakingly put together. We saw the thermal shield for a solar orbiter designed to keep extreme levels of heat away from delicate instruments that need to be kept at room temperature while passing closer to the sun than any other probe before. Few people will ever get to see the back of this shield, but Aleksandra and I are now among that small number. We also peeked in on fuel tanks milled out of solid blocks of titanium (welded ones could not stand the stresses involved in leaving earth’s gravity well), quartz manufacturing rooms and space blanket sewing workshops, all connected by long bright regular corridors that took my breath away. The high point of our entire visit, however, was undoubtedly the ‘Mars Yard’, a large self-contained room with its own control room where they are replicating a stretch of Martian terrain for a new lander. Dubbed ‘ExoMars’, it is designed to navigate around the surface of the Red Planet using visual recognition software and stereoscopic cameras mounted at the front of the rig. Instead of travelling centimetres at a time, like previous rovers, because it constantly requires new coordinates on where to move to next, this one will be able to follow more general instructions – such as ‘head for that rock over there – then it will be left to make its own way there. In order to develop the software required for this system to work, the whole of Mars Yard is designed to replicate as accurately as possible the visual conditions as well as the immediate surface and terrain of Mars. There is a life-size photographic panorama of the Martian landscape taken from a previous lander, plus a wide expanse of sand studded with rocks, boulders and outcrops. The rover stood over in the far corner ‘resting’ while we were there. People cannot be in the room when it is switched on, as their presence will only confuse its sensors – the whole space is painted a neutral shade of ochre so no sudden changes of colour can distract it. The overhead lights are set to replicate lighting conditions on Mars, and the sand has been specially selected as well. It was like a large stage set waiting for a movie to happen – and then it did. ‘Would you like to take some photos?’ our host asked. Aleksandra and I were both genuinely surprised by this as we had been specifically requested not to bring cameras. ‘Is that really all right?’ Aleksandra asked. We were assured that it was okay. I said I had one on my phone. 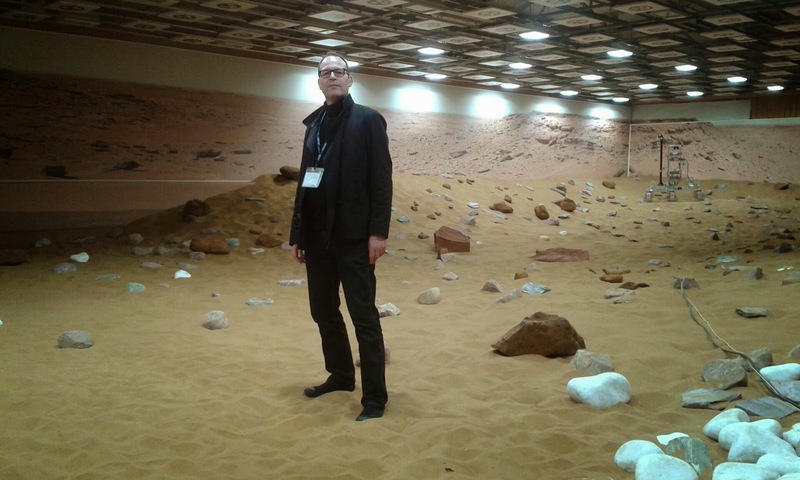 ‘You can also walk out onto the surface of Mars if you like,’ the guide said. I could not believe what I was hearing. ‘Ken should go first,’ Aleksandra offered. ‘He’s always wanted to walk on Mars.’ I thought this was really a gracious gesture from the First Woman on The Moon. This is a proud moment, I murmured as I stepped out onto the sandy topsoil and walked across the surface of Mars. I turned, and Aleksandra took a couple of pictures – the sand was really loose and yielded easily under your feet, worse than beach sand. Soon I stepped back down again and photographed Aleksandra conquering her first planet and pointing towards the ExoMars rover in the far corner. I really cannot express how thrilling the moment was – our host even took a photograph of the two of us together on Mars. From experiencing a hospital cancer ward as a space station to walking on Mars seems to have taken less than a step, and yet I also find myself millions of miles from where I was a year ago. I could not have imagined this happening back then. As Aleksandra and I returned along the length of Mars Yard we noticed a red admiral butterfly lying dead on the guardrail – it seemed entirely appropriate somehow. No summer lasts forever – but this had been a great moment. Pictured above: KH on Mars photographed by Aleksandra Mir – note the ExoMars rover at the far right of the Mars Yard. Wow! And good news also.